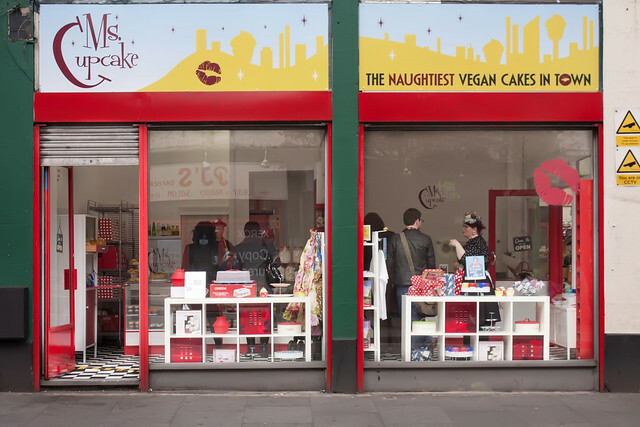 Ms Cupcake is fast achieving London Vegan icon status, a standing her baking has seen the business achieve since well before throwing open the doors of the city’s first all-vegan bakery. 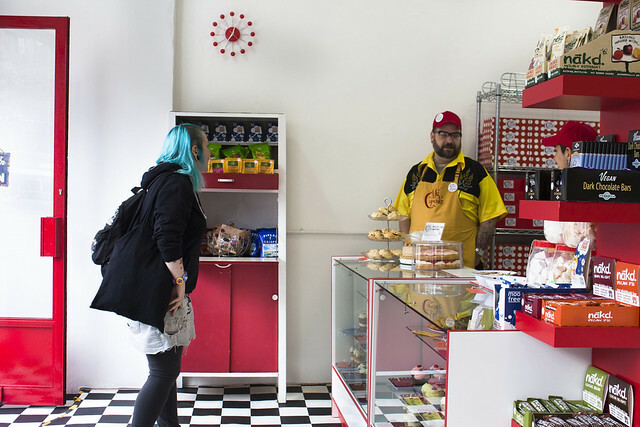 Always presenting herself in an eye-catching 1950s housewife ensemble, the woman behind the cake has a sparkling personality to match her retro-inspired shop design. From market stall (you can still find her at Greenwich and Brick Lane sometimes- check her website for details) to full retail bakery, it’s no surprise the business has been such a success; her cakes have had folks trekking across the city to devour since the start. 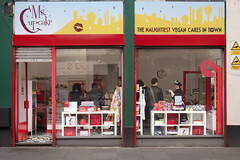 And to make things even more enticing she’s selling more fabulous animal free confections in the Brixton shop. 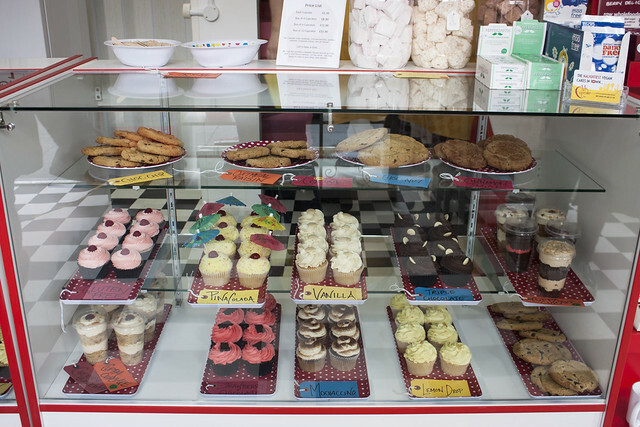 Cookie cakes, vegan marshmallows and scones feature among the usual line-up of cupcakes and cake slices, companioned with an array of other vegan favourites like Goody Good Stuff sweets and vegan chocolates. Cookbooks, brand-matching retro kitschy accessories, and of course cupcake themed gifts are also for sale. Finally, it’s here! After many months of hard work and planning, London’s first vegan bakery has opened in Brixton. My friend Jojo, the blogger behind Vegan in Brighton, and I journeyed to the city yesterday to support Ms C’s opening day and to sample some of the wares (throwing the former in there to make it sound like the trip wasn’t really all about the latter). We felt right at home (and not just because the shop was decked out with pretty much the same Ikea furniture in our homes). Ms C’s warm welcome and the friendly smiles of the entire staff, who are all extraordinarily marvelous by the way (I want to take them all home), will make anyone keen to settle in for some serious cake consumption. There’s limited seating outside, shared with the cafe next door (where you can grab a coffee to enjoy with your cake), but it’s all under cover. Go sit with some strangers and make new friends. Do it. 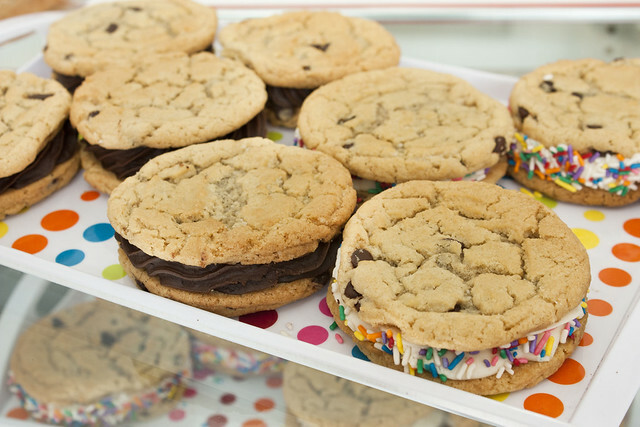 In addition to cupcakes, there are cookies, cookie sandwiches, and cupcakes in a cup (for the serious sugar seekers). Flavours change frequently, so you’re pretty much going to have to show up every day to get a chance to sample them all. Vegan bakery stalking is a practice I highly recommend. 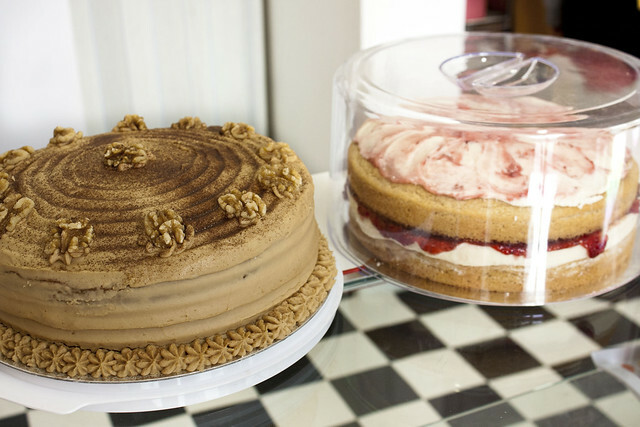 One of my favourite things about Ms C, aside from her confectionery prowess, is her support of other vegan bakers. Competition is stiff and she’s on top, but her friendship with, awareness, and support of her baking counterparts never ceases to give me the warm fuzzies. There are also plans in the works to offer classes at the retail location, so be ready to get your icing mitts on and create! Kids can enjoy decorating classes, and once the shop is up and running the fun will be extended to grown-ups too. Drool away, and be sure to remember Ms Cupcake does private orders too! If you’ve got a birthday, wedding or cake fetishist awareness party in London, then she’s the lady to talk to. Brixton is quick 7 minutes hop one stop down the line from London Victoria on mainline rail services, also accessible by tube in 10. From London Bridge grab the Northern line South to Stockwell and change to the Victoria line for Brixton. The shop is just a few minutes’ walk from both the mainline and underground stations. Your photos are stunning. The store is lovely. I can’t wait to go back. Thanks! I think I’m going back next weekend. It’s too good to stay away.